March Madness - how did current Twins did in college? March Madness is upon us. I’m nothing close to a college basketball specialist, but it seems to me that not even the most optimistic Minnesotan believes that the Golden Gophers will go far in the Big Ten Tournament -- but, who knows? Either way, with or without the presence of the UMN boys, a number of people will hop on the Bracketology train and have a lot of fun during the month of March. Motivated by the school spirit brought by this event, I decided to look at how some Minnesota Twins did while they were playing in college. I came across a lot of interesting facts and numbers from the time that these now Major Leaguers were just a bunch of hopeful kids attending classes everyday. Here’s a list that I’ve put together, with a personal experience shared at the end. Kyle Gibson was a vital part of the Twins rotation last year, after struggling in his first years in the Majors. And that's actually a bit similar to how his college career went down. He was off to a slow start, coming out of the bullpen during his freshman year for the Missouri Tigers, in 2007. But then, when he started being used as a starter in 2008, he turned the corner and pitched at a good level in the following two seasons. In his last year in college, he posted a 3.21 ERA and 11.05 K/9. Gibby and the Tigers played the NCAA Regionals in all of the three years he was there. Tyler Duffey was Drafted by the Twins in 2012 out of his hometown college, Rice University, in Houston. He spent three full seasons playing for the Owls, between 2010 and 2012, helping the school to claim its fourth conference championship, in 2011. Curiously enough, do you know who was elected the conference MVP that year? That’s right. Duffey. He helped the Owls to finish the regular season in first place (16-8 conference record), with the highest number of wins (42-21 overall record) and to be the #24 program in the nation. He shared closing duties with former Twin J.T. Chargois. Trevor Hildenberger also spent three seasons in college ball, but his overall numbers weren’t nearly as impressive as his stellar Minor League totals nor his first months in MLB. Coming out of high school, he pitched for the University of California, Berkeley starting in 2010, but he was redshirted during the 2011 season. His best season was during his senior year, in which he posted a 2.83 ERA and tied the school record of ten single-season saves. On May 10th, 2014 he pitched 3.0 innings to earn a save, striking out six batters, his career high. Veteran relief pitcher Blake Parker wasn’t always a pitcher. During his three seasons playing for the Arkansas Razorbacks, from 2004 to 2006, Parker served as the team third baseman. Drafted in 2006, he had a very slow start as a position player on Rookie and A ball and started his transition to the mound in 2007, to never turn back. As a position player in college, his best season was during his sophomore year, when he had a .865 OPS and was an extra-base maniac, with a 54.55% XBH%. After maintaining a 2.85 ERA in ten years pitching in the Minors, he knew he made the right call for his career. Taylor Rogers is a superstar in the making right now. But his college career was nowhere near an indication of that. After being drafted by the Baltimore Orioles out of high school in 2009, he decided not to sign with them and to attend the University of Kentucky. He was a starting pitcher for the Wildcats for three seasons and when we look back at his performance there, we get shocked. Look at what his Wikipedia page has to say about his college career: “In 2010, he tied for the Southeastern Conference lead in losses (7) and runs allowed (68), as he went 4-7 with a 6.40 ERA. In 2011, he tied for second in the Southeastern Conference in losses (7), and was third-highest in runs allowed (56). In 2012, he was fourth in the Southeastern Conference in runs allowed (45)”. Can you believe this? Addison Reed MLB career is pretty respectable. His college career? It was monstrous. In three seasons pitching for the San Diego State Aztecs, Reed was one of the best pitchers in the country. During his sophomore year, in 2009, he led the nation with 20 saves in 20 save opportunities, striking out 38 batters in 27.2 IP (12.36 K/9) and finishing with a 0.65 ERA. He was named the 2009 National Stopper of the Year by the NCBWA. Another player who had an astonishing college career was C.J. Cron. In three years playing for the Utah Utes, between 2009 and 2011, Cron was acknowledged as one of the best first basemen in the nation. Not only did he have extraordinary individual numbers, but he also helped the Utes to reach the regional finals in 2009, his freshman year. During his junior year, the last one before being drafted, he was “named a first-team All-American at first base by Baseball America, NCBWA, ABCA, Perfect Game, ESPN, and the Collegiate Baseball newspaper (Louisville Slugger)”, after slashing .434/.517/.803 (1.320 OPS). When the Twins signed Jason Castro to a three-year, $24,5 million contract in 2017, they did it mostly because of his defensive skills. As a major leaguer he hasn’t lived up to his minor league offensive numbers and certainly hasn’t for his college numbers either. Castro played very well offensively for Stanford, especially during his junior year. 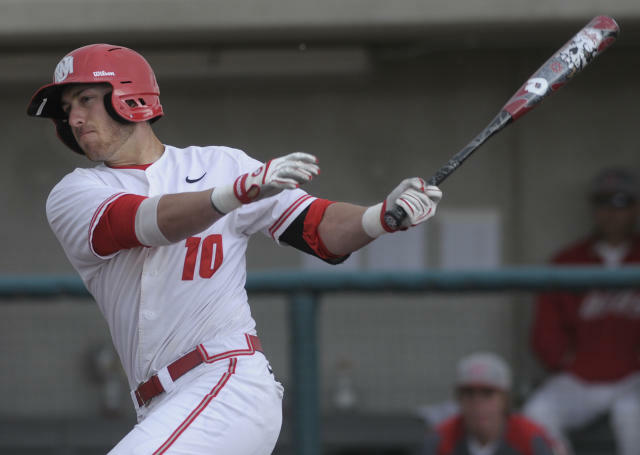 Not only did he lead the Cardinal in batting average (.376), hits (105), doubles (18) and RBI (73), he also “earned first-team All-Pac-10 honors, second-team All-America accolades from Rivals.com and third-team All-America recognition by Baseball America, ABCA/Rawlings and Ping!Baseball, while he was a finalist for the Johnny Bench award honoring college baseball's top catcher”. With Stanford reaching the College World Series that year, Castro was named to the All-College World Series team, after hitting 6-for-18 (.333) on that series. Last, but not least (especially for me, but I’ll get to that in a minute), there’s Mitch Garver, who played for four years for the University of New Mexico, in his hometown of Albuquerque, between 2010 and 2013. Garver was one of the best catchers in the nation. In his senior year, he slashed .390/.458/.589 (1.047 OPS) and led the team in multiple stats. But not only did he succeed individually, but he’s also led UNM to two of its three Mountain West Conference titles (2011 and 2012), including the very first one in history, making him one of the best Lobos of all-time. Garver also takes much pride in his state’s roots. I don’t know if many of you will remember, but during Players Weekend last year, he used a New Mexico flag bat. What makes Garver’s college career so special to me? In 2013 I was granted a scholarship from my university in Brazil and I managed to spend six months in the US, studying at UNM. At the time, basketball was my main passion and I took every opportunity I had to go watch the Lobos basketball team, which was pretty good at that year (until a tragedy at March Madness ruined everything…). 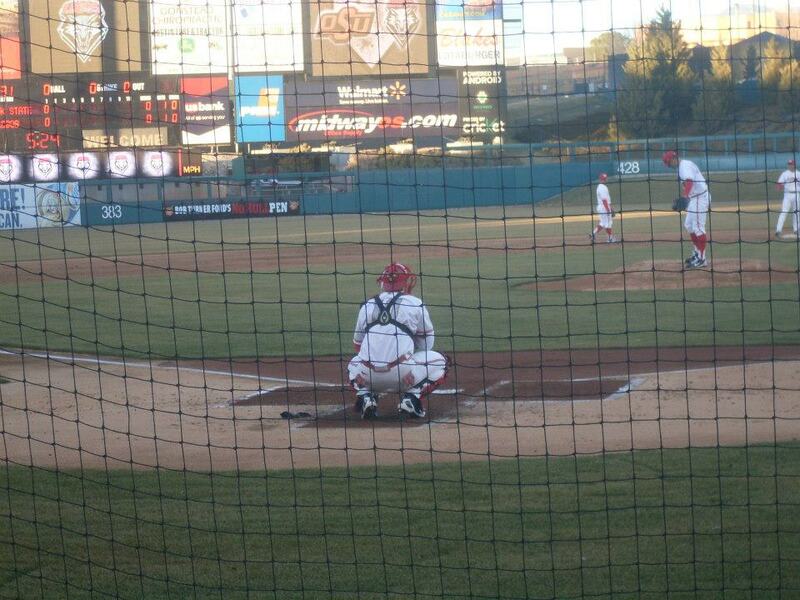 But I took one chance to go to the Isotopes Park, home field of the Albuquerque Isotopes, the Triple-A affiliate of the Colorado Rockies, and attended the very first (and only) baseball game of my life, when the Lobos hosted Oklahoma State. Back then, I didn’t follow baseball nearly as much as I do today. So I had no idea who any of those players were. It only occured to me last year, when Garver started to get his first Major League chances, that he was much likely there, behind the plate, during that particular game. I checked, and, yes. He was at that game (look at the picture above, which I took on that day). The Lobos trailed 4-2 on that February evening, the ballpark was empty before the game was finished and the pitcher I actually went there to watch (because we took one class together) didn’t even play (I think). But, in retrospect, I can see how meaningful that day was to me and Garver was a part of that. You've still only attended one baseball game to this day? In 2013 I was granted a scholarship from my university in Brazil and I manage to spend six months in the US, studying at UNM. Does that mean English is not your first language? You write well if it is, but if it's not, that's doubly impressive. Hi there! After my exchange semester was finished, I had to come back to Brazil and, unfortunately, I still haven't got the chance to go back to the US. So, yes, that's still the only one. Hey there! It does. My mother tongue is Portuguese, as I'm Brazilian. But I am both, a journalist and an English teacher, so I guess that explains a bit haha Thanks for reading and for the kind words. Okay, now it makes sense. I cannot imagine a life without live baseball. I hope you make it back to the USA to watch more baseball soon. Minnesota is beautiful (when and if) summer ever arrives. Gibson didn't give up one dinger in college in 259 innings?Is that right? That is pretty amazing. → March Madness - how did current Twins did in college?